Expand search to view more listings in and around Savannah. See more offices in and around Savannah. Offices.net has 1 Savannah executive office building with a range of temporary office space currently available for immediate occupation, with convenient rental lease terms. Many of our offices offer simple, short term and flexible rental agreements, so that your business can gain the benefits of a wide range of amenities and a prestigious business address in Savannah, with a contract that is tailored to suit your business' needs. Savannah has an economy which was historically built upon agriculture due to its ideal cotton growing climate. However, in recent years the industry has turned towards manufacturing, military and tourism for revenue. The Port of Savannah is also an important factor. Our flexible offices provide an easy solution to working in Savannah, and in many cases also offer the option of increasing or reducing the amount of space rented at very short notice. This type of flexibility is ideal for start-ups and companies that are likely to grow fast, as well as for those that are downsizing. A wide selection of the business centers are inclusive of a range of business services which include office administration, reception and on site IT support staff, high speed internet and WiFi services, lounge and meeting room amenities. In addition, a number of the office buildings provide free car parking, all-hours access, dining facilities and break out areas. Just choose one of the offices for rent in Savannah displayed above. 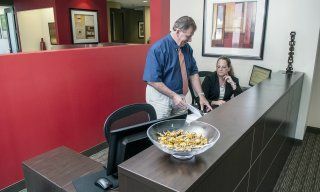 Every one of the offices boasts an excellent business position in Savannah, with flexible terms to suit your work needs. Whether you are looking for short or long term office space or the option to expand and contract your operations as necessary, Offices.net is here to help. Search through the available office space on the site or phone us to discuss your specific requirements.